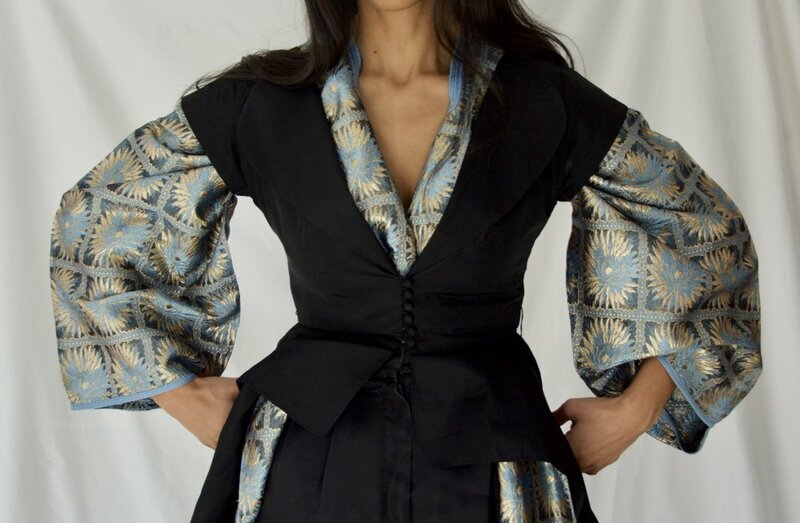 What I've done to achieve this look is wrapped the sleeves of the kaftan around my bodice, folded and tucked them et voila! Here, the volume of the sleeves is exaggerated by the addition of this 1950s hostess gown. Worn over high-waisted silk pants. 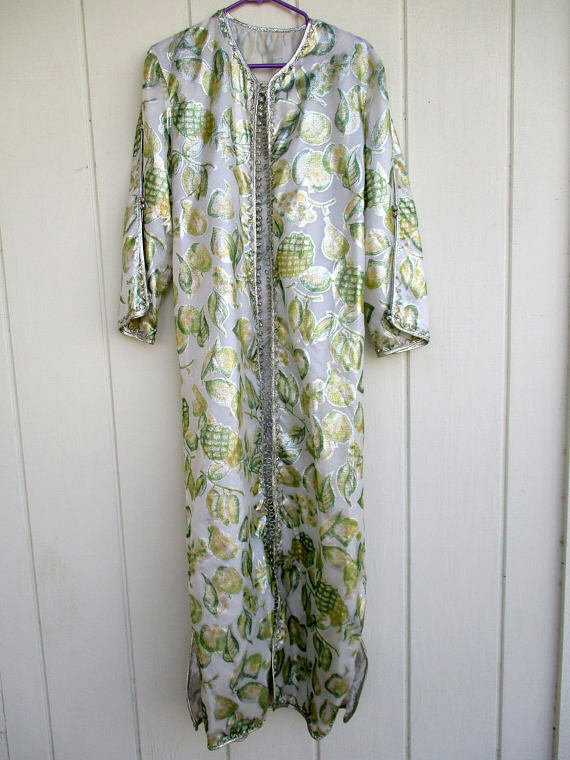 Two of my favorite words just might be vintage and kaftan. Put them together and not only do you have an intriguing sentence, but, really, a virtually instantaneously interesting outfit. How can one go wrong wearing a kaftan that's already been worn? One can't, which is why I'm here touting the merits of vintage kaftans. Vintage kaftans, be warned. We're coming for you. In a tiny treasure trove nestled deep in the Marrakech souk on a trip last year, two friends and I hunted for hours on end for the perfect vintage kaftan. After asking the shopkeeper to excavate what must have essentially amounted to his entire inventory of kaftans, I spotted this one. 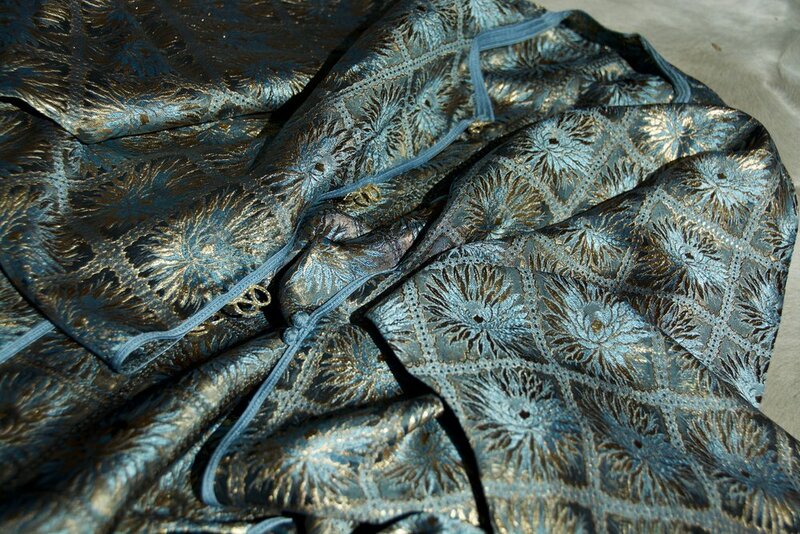 An icy blue floor length kaftan with a geometric gold print. It was, of course, love at first sight. All the other kaftans disappeared, and only this one would do. Luckily, though, it has also blossomed into a meaningful romance this relationship between my kaftan and me. So meaningful that I want to wear it all the time, which has compelled me to think of creative ways to maximize my enjoyment of this sumptuous thing. Here are three. Never doubt the sheer potency of a pair of well-worn denim. 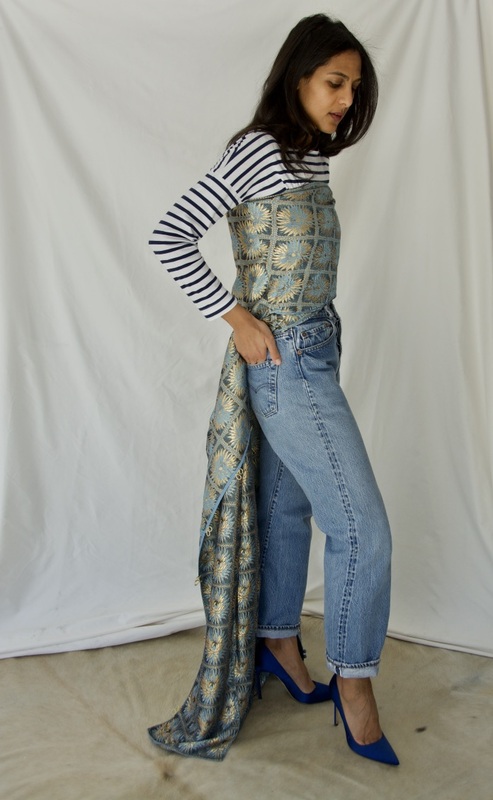 This pair of vintage Levi's from the other treasure trove that is the denim collection of What Goes Around Comes Around in Soho make me so happy I can't begin to describe the joy. Worn with a Saint James for J. Crew shirt which I mostly clean and exercise in (in that order of frequency). 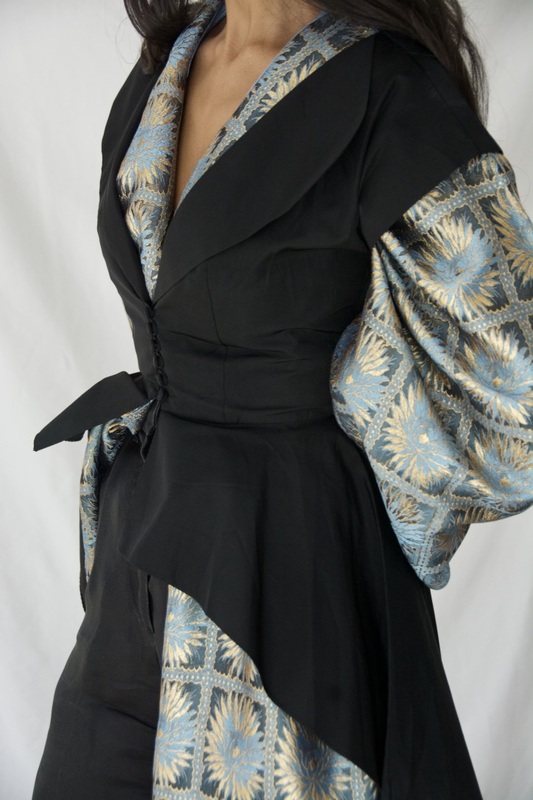 Back to the annals of layering, here the kaftan goes under this asymmetric 1950s hostess gown, paired with the most beautiful pair of high-waisted silk pants from Anna Molinari. I have worn these pants with such shocking frequency in my life that I confess to staying awake one night in Paris worrying about what I would do if something happened to them. Needless to say, I headed to my seamstress and had the exact pair replicated to avert the potential for future disaster. I'm under-layered as far as I'm concerned but what I lack in layers I have made up for in voluminous sleeves, which is thrilling. I'm also wearing a vintage Assiut shawl as a sort of turban, old earrings from the bazaar in Cairo (which I haggled over with the shopkeeper for hours), and a piece of vintage velvet ribbon as a belt. I prefer the other two ways I've styled the kaftan (did I mention I love layers), but I am particularly happy wearing this because of all the pieces of the outfit that connect me to places and memories I hold dear. If you're on the hunt for a kaftan to call your own, I'd suggest, as a start, searching for one that's lightweight enough to allow you to wrap and pin and tuck the fabric to your heart's content. Next, make sure it's slit down the middle, as in, the buttons down the front are not just a look, but actually open. Many of the vintage ones out there can't be worn open which is what gives you the flexibility you need to live your best life in this thing. Know what I mean? Try this and then let's talk. I'll be here, wearing my kaftan.